Spoken words are fleeting, and many people with autism have trouble holding on to them long enough to extract meaning from them. The Picture Exchange Communication System (PECS) for children with autism help capture transient words in images. The concrete images can make creating connections between words, ideas, emotions and things much easier, and they work for both verbal and nonverbal children. The Picture Exchange Communication System (PECS) is an intervention program that helps people with developmental disabilities to communicate more effectively. The augmentative intervention is simple, and it uses inexpensive materials. B.F. Skinner's book, Verbal Behavior, is the inspiration for the program. The pictures are usually on laminated, two-inch squares with Velcro on the back. The images usually have the word written in lower case above or below them. The picture communication system, like applied behavioral analysis (ABA), breaks things down into small steps. Each phase of the system serves as a foundation for the next, and some kids may take longer in certain areas than in others, depending on their level of functioning. The systematic approach has six phases, and images are key in nearly every step. Images are integral to the communication system, and the program begins with a fundamental give-and-take exchange that builds into answering abstract questions. PECS begins with concrete pictures and motivation, and gradually moves the child to spontaneous communication. The first phase teaches children basic give-and-take exchanges inherit in language. It uses single pictures of desired activities and objects. The child makes a connection between giving the picture and receiving the reward. The second phase increases demands by putting more distance between the child and the picture. Instructors use the images in different areas, and different people may encourage the child to use use pictures to communicate wants and needs. This phase helps the child generalize the skill. Phase three requires the child to discriminate between two pictures. Not only does the child use the basic give-and-take exchange, he or she has to select the right image to get the desired response. Some children are able to discriminate between more than two pictures. This phase also introduces the communication book, which is simply a ring binder with Velcro strips. The child has quick access to the pictures for exchanges. Motivation is an important factor in the fourth phase of the program. The child uses a simple sentence strip that begins with a picture representing "I want" followed by a space for the desired object or activity. Although the child has been communicating wants and needs using the images for awhile, this is an important step because it helps the child create sentences. As the child progresses in the fourth phase, he or she may begin to add attributes, prepositions and verbs. Complete a simple sentence, "I want ball"
Add attributes, "I want the big yellow ball"
By this stage, the child is able to initiate communicate with the sentence strip. The fifth phase requires the child to answer the simple question, "What do you want?" using the sentence strip. The child learns how to answer questions like, "What do you see?" by using sentence strips with responses like, "I see a cat". The sixth phase can go in many different directions, and options are only limited to the pictures you have. Where can you find PECS for children with autism? You child's Early Intervention provider can help you find the images you need, but other resources are available. The first place to look is Pyramid Educational Consultants, which is the website for the organization that developed the communication program. PECS 4 Autism sells communication books, pictures and related products like schedules and daily living step-by-step charts. 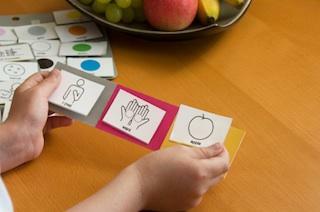 Practical Autism Resources has free printable images that can be used in communication system. Do2Learn has many printable images organized by topic, including self-help, safety and social. PECS for children with autism is an evidence-based approach that is effective in teaching children functional communication. Not only do kids learn the fundamentals of communication, they also learn that words relate to objects and activities. Over time, they may learn how to understand and express abstract concepts, like feelings.